Simplicity: For those who like their food served plain, grilled salmon with local vegetables is a hit. Salmon and sturgeon are luxury fish that people rarely can afford. However, one restaurant in the hill city of Da Lat is attracting diners looking for the best in home grown food. Minh Thu reports. Located on a small and quiet street of the Central Highlands city of Da Lat, Eros Ca Hoi (Salmon) Restaurant seems to always be crowded and bustling. 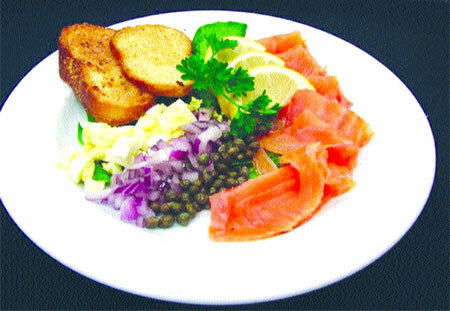 The restaurant is well-known among gastronomic tourists to the city, as it serves dishes made from salmon and sturgeon, which are raised in nearby farms. When we asked our taxi driver about must-try food in Da Lat, he suggested several famous specialties, such as hu tieu (noodle with seasoned and saute beef), nem lui (grilled chopped meat) and salmon. Wait, salmon? It's our favourite dish, but we seldom eat it because it is so expensive. The driver said, with a decisive tone, that we should try salmon that had been raised in Da Lat city in recent years, and we would taste how it is different from salmon imported from Norway and Japan, popular in Ha Noi, but expensive. 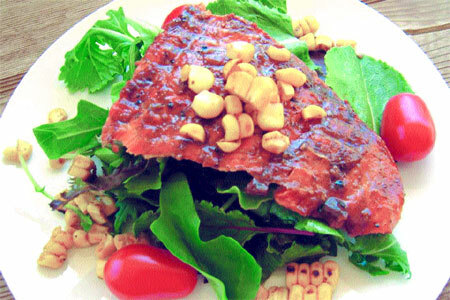 Simply delicious: Fresh salmon can be served as sashimi, grilled with barbecue sauce or served with bread and salad. The bones can also be served up in a hotpot or as a soup. We made a quick search on travel forums and discovered that the most famous salmon restaurant in Da Lat was Eros. There were so many reviews about it, so we went there. A pretty waitress welcomed us at the gate of a French style villa where the restaurant was located. She briefly explained that the restaurant specialised in serving dishes made from salmon and sturgeon. She also showed us a menu of dozens of dishes, ranging from salad, soup, grilled, fried, baked and hot-pot, and all are made from two kinds of fish. Finally, the waitress suggested my husband and I visit the fish tanks, select a live salmon, and the chef would cook three different dishes from that fish. Chef Le Hai An helped us choose a 1.2kg salmon. He told us that one raw fillet from the fish could be served as a sashimi, while another could be grilled, fried or baked. He would also use the head and tail of the fish to cook a hot-pot or porridge. In front of our eyes, he quickly sliced the fillet, convincing us that the sashimi would be very nice because the fish was fresh, not frozen. "Each cut should be done smoothly, not in a sawing motion," he said. "When it comes to raw fish, there's more to good sashimi than just being fresh." In the twinkling of an eye, he displayed slices of salmon sashimi on a wooden tray over a layer of ice to preserve its fresh taste. Comment: fresh salmon and sturgeon, you can select from a-la-carte menu or ask chefs to catch a live fish and process it into three/four dishes, price at VND500,000 (US$25) for two people, playground available for children, Vietnamese, French and English-speaking waiters. It was then served with lemon juice, balm-mint leaves and seaweed. I wrapped the sashimi with leaves and dipped it into soy sauce mixed with wasabi (mustard). Well, the nippy, pungent and aromatic sauce made the taste of salmon sashimi extremely delicious. We lavishly praised Chef An when he grilled the other fillet of the salmon in a barbecue sauce with sesame. The scent of the dish satisfied half of our stomach and its taste filled the rest. While my husband and I ate until we were filled with fillets, the chef feasted our two-year-old son with salmon porridge cooked with vegetables. He still said "more" after finishing two bowls. 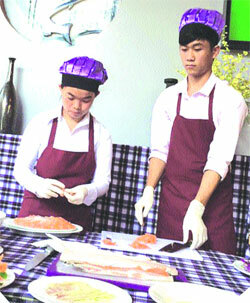 Salmon is sold for VND420,000 (US$20) per kilogram. From a fish, the chef can cook three or four dishes. Customers pay for their dishes based on the fish's weight. All spices, vegetable and other ingredients served with the fish are provided at no charge. Chef An said the fish were bought from a farm at Giang Ly Company in Da Chai Commune, Lac Duong District, 50km from the Da Lat city's centre. 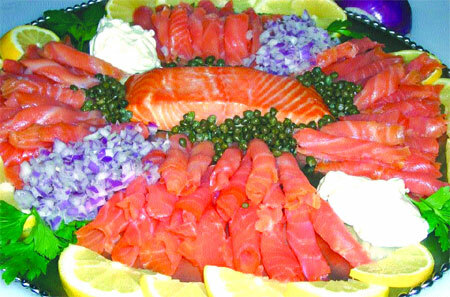 The company started raising salmon and sturgeon in 2007. Due to the attractive surroundings and weather, the trade has developed and now there are about 20 ponds in an area of 30ha supplying fish for Da Lat city and the Central Highlands region. If you go in a large group, you can select a big salmon, up to 5kg, or order from an a-la-carte menu.